In the shade of sandstone spires, lies a wonderful area with lots of natural beauty and history. There are 10 miles worth of trails here. 30 minutes or more, depending on which trails you get on. Trails can be slippery and icy in the winter. Red Rock Canyon is an open space on the west side of Colorado Springs. In many ways, it’s a miniature version of its neighbor, Garden of the Gods. 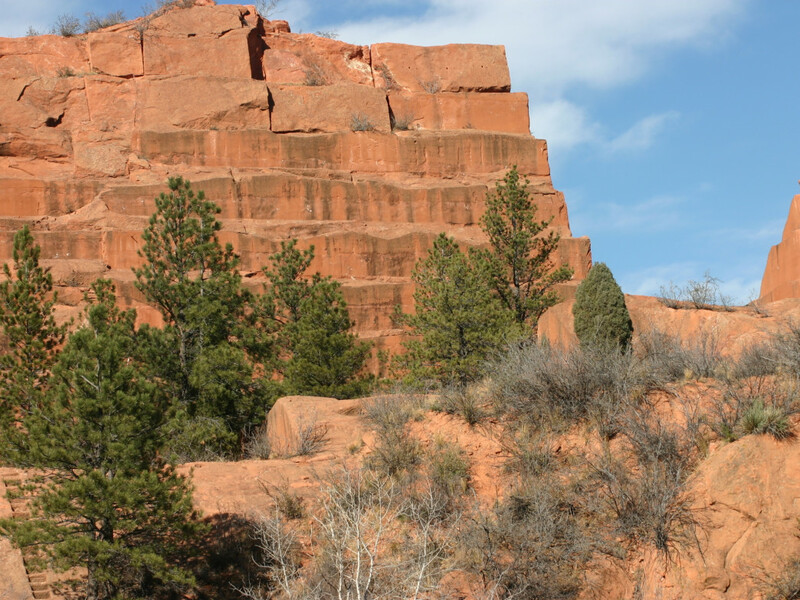 Dusty red sandstone spires and rock faces attract climbers, and between the rocks, a series of trails wind along past glassy ponds. Red Rock Canyon has a lot of history. Its geologic history dates back 300 million years and rocks examined today tell of a river and shoreline that attracted plant-eating dinosaurs, and waters where shark swam. Its human history includes a time as a sandstone quarry, and most recently, as a private residence. In the 1970s, the owner dreamed of developing a World Trade Center here with a teleport center, golf course and medical research center. 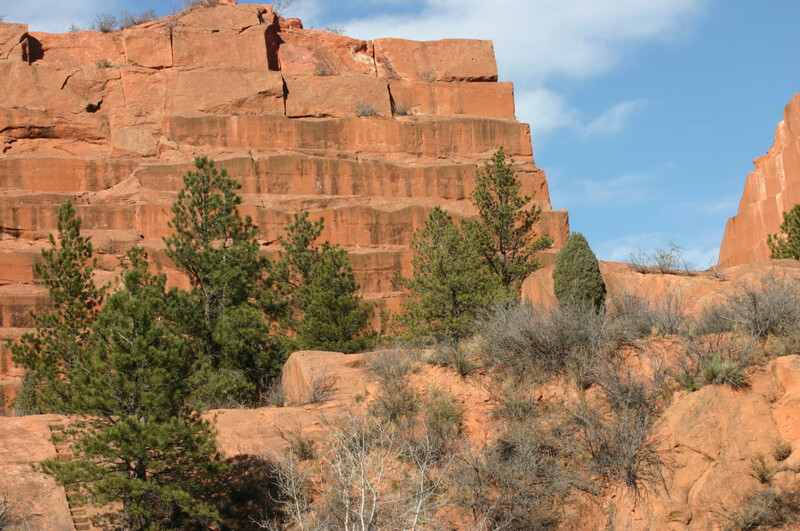 But that never happened, and in 2003, the city of Colorado Springs purchased Red Rock and designated it open space. Just two miles from its big brother, the Garden of the Gods, Red Rock Canyon is a mini Garden with an extensive trail system. There are 10 miles of trails that connect with each other and with other regional trails. It’s a popular destination for runners, hikers, bikers and horseback riders, and it’s open from dawn to dusk. Rock climbers have placed dozens of bolted routes on the dusty red upright slabs. This is a very popular park (parking lots fill up on most days). And there’s a reason - Red Rock has well-thought-out trails. It appeals to people for many different reasons. Its hogback “spine” of rocks holds shark’s teeth and ammonite fossils. There’s even a documented dinosaur track here (probably a plant eater – a hadrosaur or an iguanodon). Numerous small meadows are favorites of wildflower fans, who will find pasque flowers, spiderwort and sand lilies. It has an off-leash dog park (not fenced) and a bike skill park. Runners share the trails here with hikers, dog walkers, mountain bikers, and the occasional mule deer, black bear or coyote. Hikers can connect with the Section 16 trail which takes them to the Pike National Forest. There are five canyons and valleys here, so even when there are crowds, it’s easy to escape them. From I-25 in Colorado Springs, take the exit to U.S. 24/Manitou Springs. Drive west through the 31st Street light, and watch for Red Rock Canyon entrance on your left at Ridge Road. There are two parking lots here. To reach a third lot, turn left at 31st Street and watch for entrance on your right. Because this area is so close to the city, there are frequent car break-ins, so either leave your valuables at home or keep them in your truck of your locked car. Red Rock is open year-round, but all trails are natural surface so they can be slippery after a snowstorm and some of the trails in the shade tend to hold ice.